The United Kingdom (UK) is considering a request to sell military equipment to Nigeria to help it fight Boko Haram Islamist militants, British Foreign Secretary, Boris Johnson, said on Thursday. 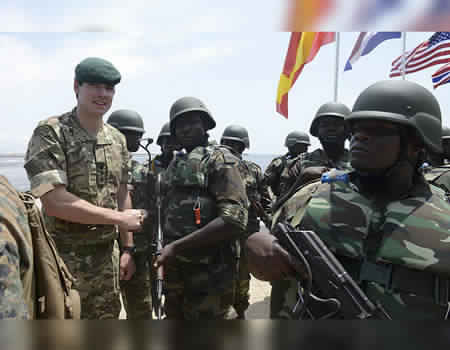 British soldiers were already training 28,000 Nigerian troops confronting the militants in the North-East, Johnson told Reuters in Lagos State. “They have put out a request for more help with materiel – equipment of one kind and another. We are going to look at that,” he said. “We will look at that very seriously on counter-IED provision, on a request for more help with attack helicopters, for instance. Let’s have a look at what we can do,” he added, without going into further details. Britain’s Foreign Office was unable immediately to provide details of military sales to Nigeria in the last few years. Just last week, the Pentagon notified the US Congress of the sale to Nigeria of 12 Super Tucano A-29 planes and weapons worth $593 million to help it fight Boko Haram. In a related development Johnson and the Department of International Development (DFID) Secretary, Priti Patel, have announced the donation of £200 million to indigenes of the North-East region. Johnson made the announcement in a statement when the secretaries visited Borno State on Wednesday, to see how the UK could lead international response to the humanitarian crisis in the North-East. He said the visit was aimed at assisting indigenes of the North-East avert famine, build stability and security after the destruction caused by Boko Haram in the region. Johnson said the UK’s response in the region would include both security and humanitarian efforts. He said both secretaries saw first-hand how British military had been providing training to Nigerian soldiers fighting Boko Haram on the frontline. The News Agency of Nigeria (NAN) reported that £200 million support was an allocation of DFID budget for four years, from 2018 till 2022. Patel had announced that the programme was built on the UK’s existing £100 million of humanitarian support for 2017. He also stressed the fact that the donation and the dedication of the UK government would serve as a lifeline to over 1.5 million people in the region. According to the statement, UK’s increased support was expected to extend the DFID humanitarian programme in Nigeria over five years. Also, Johnson and Patel, on Thursday, met with Vice President Yemi Osinbajo in continuation of their official visit to Nigeria. Speaking to newsmen after the meeting, Johnson said the United Kingdom was ready to assist Nigeria in humanitarian, development and military fronts. He described Nigeria as an “incredible country and power house of the African economy. “This is an incredible place. It is the power house of the African economy. We are with Nigeria every step of the way,” he said. The envoy said the delegation had fruitful meeting with Osinbajo and looked forward to better relationship with Nigeria. Patel said she was satisfied with the outcome of the meetings the delegation held with the vice president and other Nigerian officials for the two days. She said the United Kingdom always viewed Nigeria as a partner. Patel said the meeting with the ministers focused on the future and the strengthening of the relationship between the two countries. She added that the interaction was to put forward the incentives to help create the right environment for investments, especially British investment in Nigeria. Minister of Foreign Affairs, Mr Geoffrey Onyeama, said the meeting covered the three priority areas of the government: security, fight against corruption and the economy. “They have been here and Maiduguri. The UK is partnering us in facing our security challenges and global threats by terrorists. “And of course, UK is engaged with us in the anti-corruption crusade that we embarked upon and very importantly also with regards to the economy,” Onyeama said. Also, the Minister of Budget and National Planning, Mr Udoma Udo Udoma, said the administration was happy to receive the UK top officials. Meanwhile, the UK government has promised to attain a better bilateral and diplomatic relationship with Nigeria. Johnson and Patel made this known at the unveiling ceremony of the new British High Commission in Abuja, on Thursday. Johnson said the new British High Commission, now located on Plot 1157 Diplomatic Drive, Central Business District, was expected to strengthen relationship with both countries. “It gives me a great pleasure to open this wonderful, new, super, colossal British High Commission in Nigeria’s capital, Abuja, although some of our officials moved in six weeks ago. “It will further strengthen the British diplomatic ties with Nigeria.